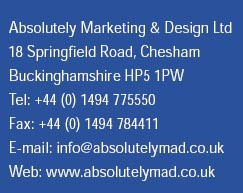 At Absolutely Marketing and Design, our main strength is our ability to understand your needs as well as what will appeal to your prospects and customers. With several years' experience in a variety of fields, our marketing team offers a full strategic campaign planning and development service, leading to significant input into the composition of our customers' marketing plans. Specialising in pan-European campaigns, we plan and execute lead-generation and customer awareness programmes for our clients (including direct mail pieces and telemarketing), as well as offering event management, collateral production, copywriting, translation, print and photography services. Our experienced account directors act as a single point of contact during a campaign, project managing all elements, ensuring that they run to time and within budget. Moreover, each campaign is completed with a full report and analysis to identify future trends and marketing programmes. Absolutely Marketing and Design also provides a full PR service, liaising directly with journalists and editors to ensure maximum coverage for our clients. So, if you need absolutely anything to do with marketing, PR and design, simply click here!